CORBA has been awarded a $5000 grant by REI to support trail work in Palos Verdes. CORBA volunteers will work with and support the Palos Verdes Peninsula Land Conservancy, the City of Rancho Palos Verdes, local environmental and recreation groups, REI, and individuals to ensure the success of trail work events. The grant includes tools, food for the trail work events, and REI products for prizes and handouts. This continues REI's and CORBA's commitment to multi-use trails. Thanks to all who have participated in past CORBA events to help us win this award. The Canyon Back Alliance, the Center for the Law in the Public Interest, CORBA, and others won a long fight that threatened to block a long used trail in the Santa Monica Mountains. The deal was approved the LA City Council’s Planning and Land Use Management Committee. 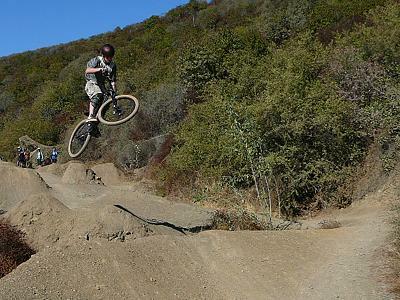 The trail in question is connects the the Whoop-de-doos trail and Kenter Avenue to dirt Mulholland and the greater Santa Monica Mountains. Thank you to all who participated in this public access battle. Your efforts have helped secure public access on the Canyonback Trail and gained a new trail that will connect Mt. St. Mary's Fire Road with Canyonback Trail—a whole new trail. Sat. Aug. 19: CORBA Trail Work Day on Rogers Road in the Santa Monica Mountains. We will meet at the top of Reseda at 7:45 am. If you can not make it that early you can always ride your bike in to meet us. Volunteers get cool trail work bike socks! For all details go to: CORBA Trail Crew Page. Mark your fall calendar for the Fat Tire Fest: October 14. The date has been set for CORBA's Fat Tire Fest — Saturday, October 14, 2006 at Malibu Creek State Park. The Fat Tire Fest is lots of fun, but it's also fun work for some. We could use your help before and during the event. Please contact Louisa, 310-374-7552 or mtbike4@earthlink.net for more information. This event celebrates CORBA's 19th birthday and includes the popular Poker Ride. Our sponsors are coming through big time. Giant, REI, and KHS have donated great bikes for the FTF raffle. We're off to a good start for this great event. Ventura County Online Bicycling Survey. Note: The CORBA eNewsletter was not published in July 2006. If you have problems reading this emailed version, an on-line version is available at http://sbmbc.com/corba/index.php?n=Programs.August2006. Please send comments or submissions to newsletter@corbamtb.com. You are receiving this because of a current or past membership in the Concerned Off-road Bicyclists Association. To unsubscribe reply with a note to that effect. Sorry for any inconvenience. Maintaining access to and gaining access to trails in Los Angeles and its surrounding areas. Educating mountain bicyclists in the safe and appropriate use of mountain bikes. Contributing to the building and maintaining of riding areas in Los Angeles and its surrounding areas.